Summer in Bruges is synonymous with music. There are several music festivals throughout the summer months, but our favourite is definitely the Bruges Triple Days, or the Brugge Tripel Dagen as it’s called in Flemish. For three days every year, the beautiful city of Bruges celebrates the country’s national day (July 21st) with music, events and good natured fun. The event features local artists and the theme is simple: To celebrate Belgium’s national day with fun, music and beer. Parents usually let their children as young as 7/8 run around freely at the festival, while they enjoy good music with a pint firmly in their hand. The festival has been going steady since 1975 and this year is the 38th consecutive year of the festival and takes place on the market square in the middle of the city. With more than 20,000 visitors annually, it’s a great event for both young and old. There’s plenty to keep you busy: Beer tasting, gigs, tourist attractions and a very popular Flanders sing-along at the end of the third day. It’s the highlight of the festival, with the whole of Bruges gathering to sing old tunes like “Hey Jude” and “You’ll Never Walk Alone” together on the square. Don’t worry if your singing isn’t up to scratch, just shout as loud as you can. If you’re planning to go to Bruges this summer, we urge you not to miss out on the fun! Plan your trip around the triple days and you won’t regret it. There will be plenty of local artists and musicians, livening up the market square and several events and exhibitions for both young and old. Bruges is only a short bus ride away from the port in Zebrugge, where a ferry takes you overnight from England. Brussels goes Medieval, OMG! Ommegang! For nearly half a millennia the Grand Place in Brussels has erupted in to a festival of pageantry in the first week of July to commemorate the ‘Joyous Return’ of Holy Roman Emperor Charles V to Belgium. This year Ommegang will take place over 3-5th July. Since it’s held in a public place you’ll be able to see some of it for free, but naturally if you want good seats in the stands then you will have to book ahead. You’d do well to bear that in mind when thinking about planning your accommodation too, it’s likely the city will fill up. On the 4th July, a pavilion is set up in the square and you can attend shows for jousting and falconry. A display of swordsmanship is put on as knights battle it out in Grand Place, and there’s a medieval fair of crafts and various other acts from jesters to magicians. 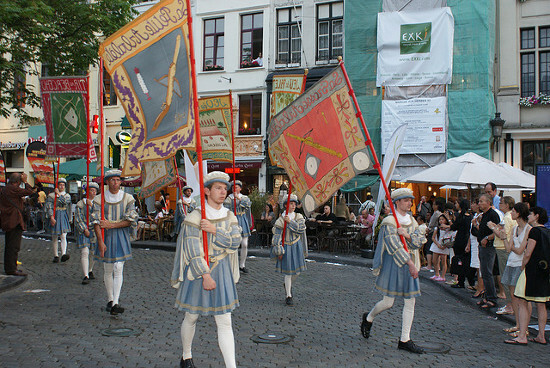 This is one of the oldest traditions in Belgium, Ommegang is a general term used in central parts of Europe for medieval pageants, but the one in Brussels is by far the largest and most famous. Over 1400 performers will make up the procession, they form an impressive sight garbed in traditional attire showing off feats of horsemanship and the choreographed dances of days gone by. The people of Brussels go all out for Ommegang. The procession will be backed with live music from professional tenors Sebastien Romignon Ercolini and Dominique Corbiau, as well as an expert light show from director Giles Daoust. This promises to be one skilfully produced procession and a great evening’s entertainment. The procession runs from 9PM-11PM and finishes up with a novel battle-royal of stilt-walkers. Great entertainment after the pomp and precision of the Ommegang pageant, a number of stilt walkers get in to a brawl trying to trip each other off of their 5m stilts until just one man remains. Ommegang does run quite late in to the night, but the early stages of the procession will be well worth taking your kids to see. They promise a bit of historical splendour to encourage a greater appreciation of the cultural heritage of Belgium. Adults will be able to enjoy themselves too; this is Belgium after all, so expect a healthy stock of ales for you to sample. What is a containerfest? Containerfest 0.1 is a new dance music festival in Rotterdam and the opportunity of the summer to get to know the best of the Dutch Electro scene. The festival’s name springs from Rotterdam’s relationship with its port and the eight stages will actually be built up from dozens of shipping containers. It takes place in the Schiehaven of Rotterdam, a part of the actual port, which will be transformed into 6 dance areas and will make for the perfect setting for an electro festival. Expect a hedonistic festival with different styles of progressive electronic music styles, performance art and breath-taking visuals. 12 Rotterdam music collectives have joined forces to host the festival and spin the finest Dutch Electro on offer. The festival will be headlined by Classified+ Blendits, a Rotterdam-based Drum & Bass collective, who gained mainstream recognition through MTV and TMF, along with Dutch rappers Redrum/Deformer. There are also loads of international acts, such as the English underground rave DJ, Scamp and New York record label owner, The Horrorist. The Line-up is quite UK-influenced with the techno producer Luke Slater, dubstep duo 16bit, and Aphrodite, one of the longest serving drum & bass producers around. Germany and the Ukraine will be represented too but the focus of the festival is definitely showcasing the local talents from Rotterdam and the rest of Holland. With more than 60 acts over 6 areas in 11 hours there will hardly be any time to get bored. The festival is all about THE next thing, extending beyond music with robot street theatre and light installations. Tickets can be bought online for just €25 (£20). And while you’re counting the days until July, you can sample a few tracks at Soundcloud. The Containerfest takes place on July 21st from 12pm- 11pm in Schiehaven, Rotterdam. P&O ferries have a convenient overnight ferry from Hull to Rotterdam and why not relax from the festival with a road trip along Holland’s seaside afterwards? We are all familiar with Tim Burton’s unique brand of cinema, but what many fans his movies might not know is that his creativity extends beyond the screen. Long before becoming an animator at Disney, and before producing and directing his iconic movies such as Edward Scissorhands and Corpse Bride, he spent hours drawing and painting and even wrote an illustrated poetry book called The Melancholy Death of Oyster Boy & Other Stories. Now Paris’ film archive, the Cinémathèque, presents a complete retrospective of the his work. The exhibition, originally shown at MoMa in New York in 2009, is on view in Europe for the first time. The French exhibition is proving just as popular, with vast crowds slowly moving through the exhibition space. It’s a well-curated retrospective and is definitely worth giving up your personal space for one or two hours. The exhibition starts with Burton’s early drawings, sketches and paintings, created while still attending high school. Many of the 700 works had been made public for the first time, and show some of Tim Burton’s early influences such as Dr. Seuss, Roald Dahl and Edgar Allan Poe. Visitors dive into Tim Burton’s fantastic universe and follow the creative process during which his much-beloved movie characters like Mister Jack, the Penguin and the headless horseman in Sleepy Hollow developed. The exhibition include drawings, paintings, personal notepads and even props from his movies, like Edward’s real scissor hands. The Cinémathèque will also accompany the exhibition with his complete cinematic work including rare very-limited distribution short films. 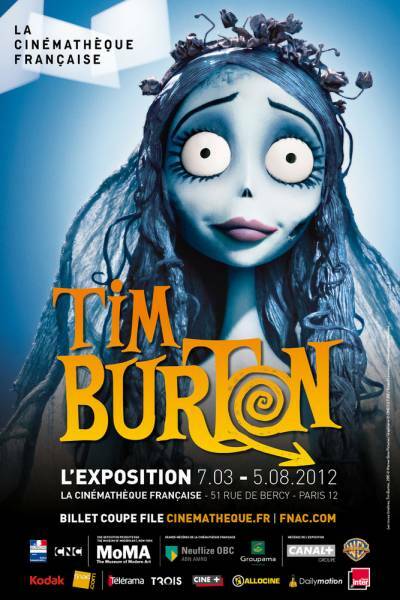 Tim Burton is among the most productive artists of our time and the exhibition is a unique opportunity to see and appreciate the extent of his output and versatility. Even though his most famous and successful works have been films, there is hardly a medium or genre the creative genius hasn’t touched: sculptures, paintings, drawings, storyboards and even his more obscure works like glow-in-the-dark velvet paintings. Once you are there, the rest of the Cinémathèque is worth checking out too. Opened in 2005, it is located in a building designed by Frank Gehry in the beautiful Parc de Bercy, close to the Gare du Lyon. It houses an extensive collection of everything film-related. The exhibition is on until August 5th at the Cinémathèque, 51 Rue de Bercy. P&O Ferries Dover-Calais service is a 90 minute journey, with up to 46 crossings every day and Paris is only a three hour drive from the port. 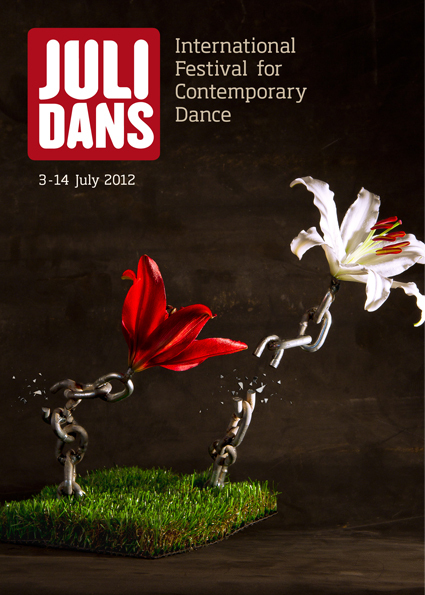 The Grand Masters and Enfants Terribles of the international contemporary dance scene flock to Amsterdam for the annual Julidans, a festival for dance taking place in early July this year. The festival has gained an international reputation for staging some of Europe’s most unconventional, controversial and surprising performances. It is an excellent opportunity to get your finger on the pulse of the contemporary dance scene and discover the up-and-coming choreographers and dancers of tomorrow. The festival will run from July 3rd to July 14th and takes place all over Amsterdam in seven different locations. A few of the performances will be held at the Vondelpark Open-Air Theatre, which will make for a fantastic and unusual backdrop to the cutting-edge performances. The choreographers and dancers come from all over the world and take inspiration from their different backgrounds, which also makes this a festival of ideas. The Dutch premiere of Exit/Exist by South African choreographer Gregory Maqoma, for example, is a dynamic mix of classical ballet and tribal dance. Eastman/Sidi Larbi Cherkaoui got inspired by manga comics for a performance that will include ten dancers, three musicians and a calligrapher. It’s unlikely to get boring with so many multimedia performances to choose from. One of the highlights will be the premiere of Creation 2012 by Canadian choreographer Dave St-Pierre. It is part of a trilogy of which the first two parts “La pornographie des âmes” and “Un peu de tendresse bordel de merde” appeared in previous editions. As the titles reveal, the Canadian belongs to the Enfants Terribles of dance, and loves to break down clichés and challenge audiences. He merges many different genres in his work and likes to keep costumes rather minimal, with a majority of his dancers performing naked (ahem). Visitors can also get a behind-the scenes glimpse of the shows, whilst filling their bellies at a “Meet and Eat” where they will be able to mingle with the choreographers, and attend one of the talks or introductions. If you happen to be a professional dancer you can also take part in a range of exciting workshops. P&O Ferries run a frequent service from Hull to Rotterdam, from there it is only a one hour drive to Amsterdam. In these tough times when a lot of us are watching the pennies the alternative of a rural holiday, as opposed to spending time in an expensive city, could be just the ticket. Travel to France is still wallet friendly if you go by ferry from Dover to Calais with P&O Ferries. You’ll be able to take the kids and your car and then all of France is open to you. There’s not even that much need to move on too far from the port city to enjoy yourselves, instead just head a little out of Calais to the national park. It’s called the Parc Naturel Regional des Caps et Marais d’Opale, an idyllic country setting for family holidays, this national park sprawls between Calais, Boulogne-Sur-Mer and Saint Omer. 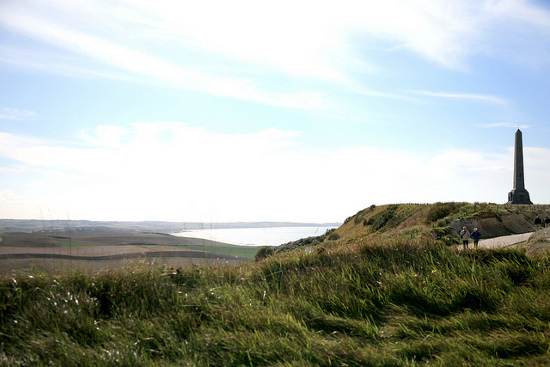 The landscape offers beaches, quiet rivers, woodland and open landscapes and marshes, perfect country for a bit of exploration in the great outdoors. For accommodation you can take your pick between chalets, campsites and caravan sites, these are all within a close proximity of family oriented activities. The northernmost parts of the national park run along the Channel so a stroll down the beach or a bit of a dip is always on the cards. This area is between Calais and Boulogne-Sur-Mer which means you aren’t too far away from urban areas if you fancy eating out or want to pay a visit to a museum or aquarium. The national park is ideal for hiking, it has numerous trails which you can see on foot or by bike and there stables if you’d like to see Parc Naturel Regional des Caps et Marais d’Opale from horseback. To keep the kids busy contact Passion Adventures, a company which arrange excursions for tree top adventures and let you hire out quad bikes to race around on. The park is home to various places of interest such as La Tour de l’Horloge museum which documents France’s history from the time of Viking invasions up to Francois I in in Henry VIII’s time. This little pit-stop in the heart of Parc Naturel Regional des Caps et Marais d’Opale is a great family day out, it has activities and dress ups as well as an educational aspect. The other must-see place is St-Joseph village, a town stuck in the early 20th century, a great little place to do some shopping or stop for food. You can buy a family pass or get a group ticket to have a look around this curious little town. If you prefer to unwind when on holidays then you can make the most of the rivers in the national park by going trout fishing, licenses can be hired for half days or more here. The journey from Dover to Calais take about 90 minutes with P&O Ferries and you can get a budget friendly price when taking your kids and the car. No, it’s not a place where middle aged women in floral skirts show off their prize winning plants. The Cactus Festival is all about music. It attracts thousands of people from all over the world every year. If you’re an avid festivalgoer, this international music festival in Bruges should definitely already be circled in on your calendar. If not, we recommend you do it immediately. Previously both Paul Weller and Kate Nash have headlined at the festival. This year, it’s Razorlight’s, turn to do the honour. The line up also includes baroque folk-rockers Yeasayer, rock icon Chris Cornell and the electro band Shantel whose gigs usually end up with stage diving and crowd surfing. With genres ranging from jazz to reggae and rap there should be something for every music lover at the Cactus Festival. Situated in Minnewater Park in the middle of Bruges, its location couldn’t be better. The city is a UNESCO world heritage site so the beautiful scenery itself should be enough incentive to drag yourself over there for a festival weekend. Being in the middle of Bruges has its advantages. There are plenty of hotels and hostels to shack up in nearby and if you want the real festival feel, bring your tent along and camp in the official camping. The Cactus Festival takes place on the 6-8th of July, perfect for a weekend away. Check out the rest of the line up here. Sounds like your cup of tea? Catch one of the P&O ferries from Hull to Zeebrugge, only a short bus ride away from Bruges. If you were planning on a quiet getaway to the Netherlands this summer then then you may want to choose your dates carefully. In July the country will be wracked with festivities, you’ll be hard pressed to find a week without some form of festival; be it music, culinary, performance arts or just a plain unexpected celebration of the weird and wonderful. On the 14th July, Rotterdam will hold the Street Science Festival. This is a break dancing competition of the highest calibre; professional dancers, DJs and MCs will attend from all around the globe to impress the crowds with creative and innovative music and performances. The competition is brought to you by World Bboy Classic and Street Science; it taps in to the latest trends of Hip Hop as well as its modern day mentality. The festival will last over the weekend starting out with a block party and trainer market along with a gathering of ghettoblaster collectors to get the celebration started. There will also be talks, panels and workshops for you to pick up some tips and perhaps a couple of insider tips. The main event, of course is the dance competition, an impressive display even to people who have never given break dancing much of a… break. To see last year’s final click here. This competition is a test of real skills, they aren’t just mastering choreographed moves, qualifiers challenge ‘The Great 8’ a troupe of the best of breakdancing teamed up just an hour before the performance. The qualifying duo will incorporate two professional break-dancers who have never worked together before to outshine ‘The Great 8’. P&O Ferries have an overnight ferry from Hull to Rotterdam so you can get go direct to the Street Science Festival this July.